I was driving down the road one day in one of my resident towns and saw this garage sale going on so I stopped because I was attracted to this old beat up wood dresser or whatever it is. Just three drawers. At the time I was redoing a guest bedroom in a tropical theme, so I painted this to match a wall hanging that had a fish on it that had sunglasses on! Mostly sponge painted the background then painted the fish on the side. Sprayed with a clear coat to protect the paint....The rest came from my head and from what my trees looked like in my yard. I changed the drawer pulls to a wicker type I found at Lowes. It was fun. Head over to http://bec4-beyondthepicketfence.blogspot.com/. You will see some adorable things! Alot of projects give life to old things! The link is on the right. Or go yo my Party Link tab and look at all of the others! It's hard to see, but the fish has on small sunglasses! What talent you have, I have enjoyed visiting your blog and became your newest GFC follower from the WED hop. Would love if you would drop by my blog at kittycrochettwo.blogspot.com when you have a chance. Have a fantastic week. I like personal pieces! This is fun! I liked your last post too. Very good. Come say hi and follow back! it looks great! nice job! 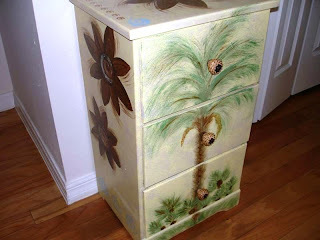 i looks like it would be perfect in a tropical bedroom! Just beautiful. I hope we will be seeing more of your painting. This is sooo nice!